Wind's winning streak continues in Massachusetts this week with three big victories - including a particularly embarrassing loss for a self-proclaimed victim of "wind turbine syndrome" whose cause had been promoted by Fox and ABC. A federal judge has dismissed a lawsuit challenging what could become the first offshore wind farm in the United States, ruling that the constitution prohibits the opponents from suing the Commonwealth of Massachusetts. The plaintiffs — the Town of Barnstable, three local businesses and an ad-hoc opposition group — sued the state in January, saying it illegally pushed electric utility NStar to buy power from the planned Cape Wind farm, the Boston Globe reported. NStar has agreed to buy 27.5 percent of the project’s power. Judge Richard Stearns of the District Court for Massachusetts dismissed the case Friday and sharply criticized Cape Wind’s opponents for repeatedly bringing lawsuits against it after they lose in court. A Bristol County Superior Court judge has found in favor of the town of Fairhaven and Fairhaven Wind in the latest lawsuit brought by wind turbine opponents. And now the real eye-roller. Last October, an ABC News report gave an extremely long, very credulous account of the story of Sue and Edward Hobart. The Falmouth homeowners claimed a wind turbine more than 5 football fields away caused a wide range of mysterious health problems, even though Sue Hobart later admitted that she had suffered from ringing in her ears for "quite a while," but claimed it had gotten worse "since the turbines." The Hobarts filed a six-figure lawsuit against the turbine manufacturer, claiming the turbine hurt the value of their home. Fox and other conservative outlets immediately seized on the Hobarts' claims to attack wind energy. It went viral with wind hypochondriacs - the original ABCnews.com article has over 1,000 comments, including tales of wind turbines causing instantaneous fainting. The Falmouth Zoning Board of Appeals declined to call a privately owned wind turbine a nuisance Thursday night, saying that claims of detrimental health effects because of its operation were insufficient. The turbine at 82 Technology Park Drive in East Falmouth is owned by Notus Clean Energy LLC. 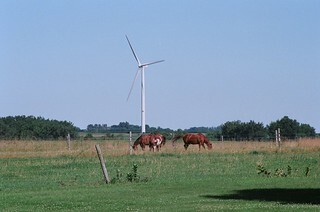 Ed and Sue Hobart, formerly of 476 Blacksmith Shop Road, complained last year about the turbine's noise and the subsequent effects on their health. Building Commissioner Eladio Gore found the turbine did not constitute a nuisance, and the Hobarts appealed his ruling to the zoning board. Zoning Administrator Sari Budrow said the four members of the board who participated in the discussion Thursday night, which was the conclusion of a hearing that began in March, unanimously found the health complaints were not persuasive. The Hobarts have sold their house and argued the loss they took on the sale was a direct result of the turbine; however, other factors, including mold and radon on the property, also were found to be at work, Budrow said the board determined. Mold and radon are both very real health threats, unlike easily disproven health claims related to wind turbines. Why didn't the original ABC article investigate whether the Hobarts' health claims were caused by mold or radon? The article never even mentioned them - the words "mold" and "radon" never appear. Did the Hobarts withhold information about the mold and radon on their property? Or did ABC choose to withhold it for some other reason? In either case, ABC didn't tell viewers the whole story. ABC should consider retracting its original report. At the very least, it should run an update and explain why viewers didn't hear about mold and radon in the first report.